Relying on the testimony of the Old and the New Testament, historic documents of incontestable authority, we have conclusively proved [The first Chapter, which is extremely long, is not included in this presentation.] the Divinity of the Christian religion. But where is the true Christianity, preached and imposed upon mankind by Jesus Christ, to be found? This is the important question we have now to solve. The Christian religion, instituted to be practised by all men, does not and cannot exist in an abstract state. It is presented to us by a concrete society called the Church, a visible society, which professes the doctrines of Christ and observes His laws. There are many religious societies, each one of which claims to be charged with the Divine mission of preserving in all its integrity the teaching of Christ and transmitting it from age to age to the end of the world. Nevertheless it is evident, as we shall soon show, that, among these Churches, differing so widely in dogmas, in precepts, and in worship, one only is the true Church; the others can be only sects, condemned by Jesus Christ, Whose name they falsely bear. The proper object of this second part of our work is to enable us to discern with certainty the Church founded by Christ, to show that only the Church of Rome, which has the Pope as its supreme head, has a right to our belief, our respect, our obedience, and our love. The order of this demonstration is as follows: Having given some general notions of the Church founded by Jesus Christ, of her nature, end, constitution, etc., we shall show that this Church is the Roman Catholic Church, to the exclusion of all other Christian communions. We shall then speak of some of her prerogatives, of her supreme head, and of her relations with the State. Finally, we must defend the Church against certain false accusations made particularly by historians, and show what she has done, and never ceases to do, for the civilization and happiness of nations. REMARKS.----1st. We have no need to dwell here upon Christian communions which have disappeared many centuries ago, leaving hardly a trace in history. St. Augustine enumerated in his time more than eighty-four heresies almost completely extinct; and in the sixteenth century Bellarmin, after mentioning two hundred heresies previous to Luther, added: "All these sects have perished; in the East there are a few Nestorians and Eutychians, and in Bohemia a few belated followers of John Huss." It is very evident that we have no need to revive these errors long buried in merited oblivion. It will be sufficient to compare with Catholicity the Churches which have preserved some vitality, that is, certain Protestant sects, and the schismatic Greek Churches. The triumphant conclusion of this parallel applies more forcibly still to other anti-Catholic sects. 2d. In this treatise the discussion takes, as we see, an entirely different ground from that of the first part of the work. There we assumed that we were dealing with infidels, unbelievers, and rationalists, who refuse to acknowledge the Divinity of Christ's mission and the obligation to embrace the religion established by Him. For that reason the only proofs we cited were historic documents and the truths of reason. Now the discussion is particularly with schismatic Greeks and those of our separated brethren, who, like us, believe in the Divinity of Christ and admit that the Holy Scripture is inspired. Therefore we may quote as decisive arguments texts of the Old and the New Testament which we both regard as the words of infallible truth. Even those who, unfortunately, reject the authority of the Scriptures can receive them nevertheless, as well as the writings and documents of the Fathers of the Church, as historic records of incontestable value. 1. DEFINITION OF THE CHURCH.----Writers assign to this word "Church" (assembly----from the Greek) sometimes a broader and sometimes a more restricted meaning. In the broader sense of the term the Church is an assembly which embraces all the faithful servants of God, whether they are still combating on earth, or expiating their faults in the fires of Purgatory, or triumphing in Heaven, including at times even the Angels. In the more restricted sense the Church is only an assembly of the faithful who are combating upon earth (the Church militant). Taken in this second acceptation the Church may include all the true adorers of God from the beginning of the world until the end of time; all, in fact, who have believed or will believe in the revealed religion, essentially the same in its three different phases. Nevertheless the word Church generally designates the Christian Church as it exists in the world since Christ came to give the final perfection to supernatural religion. In the present treatise we are considering the Church in this last or more restricted sense. Thus understood it may be defined as the society of the faithful instituted by Christ to preserve His doctrine, observe His laws, and thus attain the final end of man, or eternal life. 2. THE CHRISTIAN RELIGION CONSTITUTES A REAL SOCIETY, A CHURCH.----Rationalists, we have seen, do not refuse to recognize in Jesus Christ the ideal type of human perfection; but however pure and striking His virtue, He is, they allege, only a simple mortal and the Christian religion is not His work; it has nothing in common with Him but the doctrine which it professes. But if this be true, how was it possible for the followers of Christ to form a society and constitute a Church? Here is the explanation which they hazard on the subject. Christians accustomed to study unceasingly the doctrine of this Wise Man, Whose life and teachings they admired, and being accustomed, moreover, to indulge in philosophic speculations, and having become very numerous, they were naturally led to form a body, or society. For the idea of Christ and His doctrine they gradually substituted that of a society founded by Him, and as they recalled the ancient glory of the synagogue they took refuge under its shadow until they felt sufficiently strong to separate from it. Thus certain rationalists insist that it was only in the second century that the Christian Church dared to proclaim its existence and appear in public, and that it was also at this period that the Gospels were written. This was the theory introduced by Strauss in Germany, and adopted in France by Littre, under the name of mythic rationalism. Of course in the eyes of such men the supernatural facts, the miracles attributed to Christ by Holy Scripture, are only myths, figurative impressions, purely intellectual conceptions. In the first part of the present work we have answered these last assertions as well as the assertions relative to the composition of the Gospels. It now remains for us to confute the false assertions in regard to the establishment of the Church by demonstrating the following thesis. But let us first explain some of the terms. We understand by the word society a collection of men uniting their individual forces for the attainment of a common end by the employment of common means. Hence we find in every society four necessary elements: the members, their united efforts, common means, and a common end. The special nature of the society is determined by the end it has in view. The end of domestic society is different from that of civil society or that of religious society. This end is what unites men into societies and determines the means they use in pursuit of their purpose. One of the most indispensable elements of any society intended to last is authority; besides being the moral bond which holds the members together it presides over them all, incites, moderates, directs, and reforms, according as it is necessary for the good of all or the individual. Thus in every society authority is invested with certain prerogatives proportioned to the end to be attained by its subjects. Now we shall briefly prove that Jesus founded the Christian society; in other words, that He Himself gathered His disciples into one body in order to pursue a common end (their salvation) by common means (preaching, worship, Sacraments), and under authority divinely established (the heads appointed by Him). Thesis.----Jesus Christ Truly and Personally Founded His Religion under the Form of a Real Society, of a Church. FIRST ARGUMENT.----We learn from the Gospel, 1st. That Jesus Christ solemnly promised to institute a Church when choosing among His twelve Apostles one to whom He gave the symbolic name of Peter. He said to him: "Thou art Peter, and upon this rock I will build My Church; and the gates of Hell shall not prevail against it." This promise already furnishes an incontestable proof, for Jesus Christ could not fail in His word. 2d. That He executed His promise and founded this Church. We read, in fact, that He gave to His Apostles the power and mission to preach the Gospel to every creature; to administer the Sacraments; to govern the faithful; and that He promised to be with them until the end of time. At the head of the Apostles He placed Simon, to whom He gave universal jurisdiction over the whole Church. This certainly was founding a religious society, a Church. 3d. We learn from the same Gospel and the Book of Acts that the Apostles, after the Ascension, fulfilled the mission that they had received: they preached the doctrine of Christ, they observed His laws, they increased from day to day the number of the disciples and governed them under the guidance of Peter, who had been appointed their supreme head. REMARKS.----W e shall find the preceding argument still more convincing if we weigh the following reflections. 1st. Christianity is not a purely abstract conception like Plato's ideal republic; it is not simply a collection of documents and moral principles offered to the admiration of the curious, but a living, concrete reality. The word religion means a society professing religion, consequently a Church. 2d. The proofs by which we have established the Divinity of the Christian religion apply, the greater part of them, directly to the Church. Thus it was Christianity, not in the abstract, but as forming a society, a Church, which was predicted and prescribed by the oracles and the prophets; it was the establishment of the Church which was marked by the seal of miracles; it was her Divine origin which was attested by the blood of Martyrs, which was miraculously established and preserved, and which produced the most marvellous fruits of virtue in souls and the richest blessings to mankind. COROLLARY. The obligation of being a member of the Church in order to be saved. ----This obligation readily follows from the preceding thesis. There are societies which are voluntary and optional; except in special circumstances no one is obliged to enter them; if we assume their obligations, it is to enjoy the advantages which they afford. Such are financial societies, such also are religious orders. If after we have entered societies of this kind we are obliged to remain, it is because we cannot leave them without violating the vows which we have voluntarily taken. It is quite otherwise with the religious society, the Church. It is a strict obligation for every man to enter it, for, as we have already seen, every man is obliged to enter the supernatural order, and this order is attained through the Church of Christ. We have, moreover, the formal command of Jesus Christ, the Founder of the Church: "Go preach the Gospel to all nations, Baptizing them. . . . He that will not believe shall be condemned." This was always Catholic belief, the doctrine of the Fathers and of the Councils. "Faith teaches us," says Pius IX, "that outside the Roman Catholic Apostolic Church there is no salvation; it is the only ark of salvation, and whosoever will not enter it will be the victim of the deluge." Let us add here a remark which we shall develop more fully later: they who, through no fault of their own, are ignorant of the existence of the true Church and the obligation to form a part thereof, are not punished for not entering it. We shall state in its proper place the conditions under which such persons may form part of the soul of the Church and enter Heaven (ch. 4, art. 1, iv.). 3. 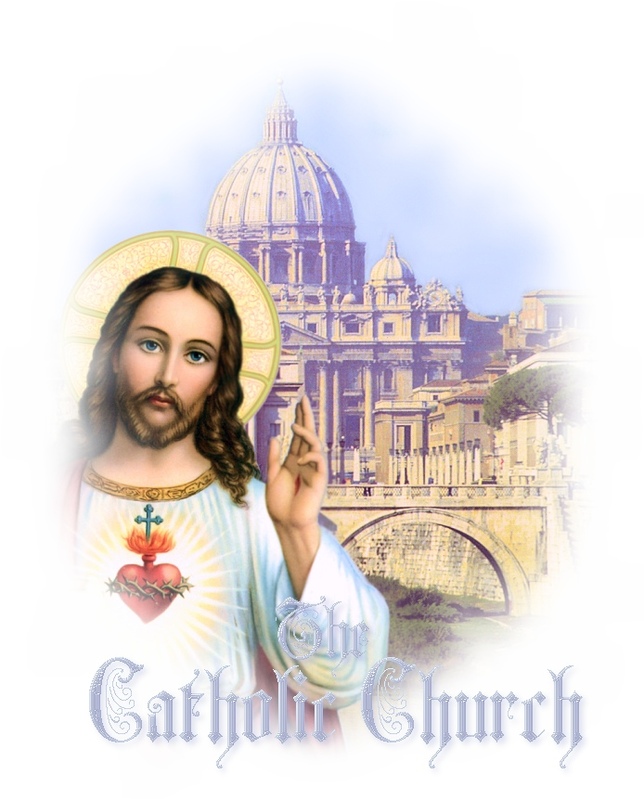 THE END OF THE CHURCH.----The proper and direct end of the Church founded by Jesus Christ, or the end which He proposed in instituting the Church, was to save souls and to lead men to eternal salvation. Nothing is more evident than this in the Gospels and throughout the New Testament. Moreover, the Church, as history proves, has never, either in theory or practice, claimed any other end. She has, indeed, contributed to the welfare of individuals and of governments; but this was an indirect though natural effect of her teachings. Considering this supernatural end, the Church may be said to be a supernatural society, a society of souls, though it is no less true that she is a visible and corporal society. In fact when she speaks to the soul it is through the organs of the body; the means she employs, preaching and Sacraments, are corporal and sensible means; the authority which governs her is a physical and tangible authority. This shows the absurdity of the following sophism of certain Protestants. The Church, they argue, is a society of souls; hence she is wholly spiritual; therefore they must reject the Church of Rome, because she has a Pope, bishops, Sacraments, and religious ceremonies. 4. CONSTITUTION OF THE CHURCH, OR ECCLESIASTICAL HIERARCHY.----In every State or civil society there are two orders of citizens, those who command and those who obey. Similarly, in the Church or society founded by Jesus Christ there are two constituent elements, those who teach and command, those who hear and obey. The first constitute the teaching Church----they are called the pastors, the ministry, the hierarchy; the second constitute that portion of the Church who are taught----they are called the faithful or laity, the fold or flock. Hence the folly of our separated brethren, the majority of whom claim that the Church is a society where all are equal; that the ecclesiastical power is vested in the multitude of the faithful; that as the faithful, en masse, cannot profitably exercise this power, deputies or delegates must be chosen to act for them; but the people, they claim, have always the right to choose these deputies, to limit their power, and to depose them when they think proper. It is clearly evident from simply reading the Gospel that such a system is absolutely contrary to the will of the Divine Founder of the Church. This will be clearly demonstrated farther on. 5. THE CHURCH IS A PERFECT SOCIETY. ----A society to be complete or perfect must possess in itself all the means necessary for attaining its end. Such, for example, is civil society. A society to be perfect, 1st. must be independent and form no part of any other society. Thus a financial society which forms a part of the state or government is an incomplete society. 2d. It must have no end directly subordinate to that of any other society: the end of military societies, or armies, is evidently subordinate to the good of civil society. 3d. It must possess in itself all the means necessary for its subsistence, its preservation, and the accomplishment of its end. Now it is God's will that the Church possess all these conditions. 1st. She forms no constituent part of any other society. 2d. Her end, so far from being subordinate, is incomparably superior to that of all other societies; moreover, every well-ordered society must ultimately be subservient to the end of the Church, which is the supreme end of man, eternal salvation. 3d. Finally, in virtue of her constitution and the assistance of Divine grace, which she never lacks, the Church has every means of attaining her end. Hence she is, as we shall prove later on, a perfect society. For the rest, a short glance at history may convince us of the fact. During the first three centuries the Church never ceased to pursue her end, the sanctification of souls. She spread and asserted herself among the nations not only without any help or assistance from the civil power, but in spite of the most cruel persecutions on the part of this same power. Besides, how could the Church, being a society of a supernatural order, receive from any purely natural society the means required to attain her end? Supernatural means alone bear the right proportion to the attainment of an end which is eminently supernatural, namely, the eternal salvation of souls. 1. Manning, Religio Viatoris, ch. iv. ; Grounds of Faith, 1. 2; Schanz, III., ch. 2, 3; Hunter, I., tr. 4, ch. 1-3; C. W. xxvi. 434, 653; Lock hart, Old Rel., ch. 22 ff. ; Picard, p. II., ch. 5. 2. C. W. xxxi., xxxii. (Genesis of Cath. Ch. ), xxxiii., xxxiv. (Christian Jerusalem). 3. Br. W. xii. 59; J. L. Spalding, Lectures, I. 10. 4. Dr. Edw. Hawarden, Charity and Truth; Hay, Sincere Christian, vol. ii., append. ; Schanz, III., ch. 9; Ryder (C. T. S. vol. v.); Balmes, Letters to a Sceptic, 1. 16; Br. W. v. 571; C. W. xxxi. 481, xlvii. ii; 145, xlviii. 509; M. lvii. 3: Ixxiii. 236, 344. 5. Br. W. viii. 527, xii. 79; Lacordaire, conf. 2 on the Church. 6. See references below to ch. 3, art. 4. "The Church was founded by her Divine Author as a true and perfect society, not confined within any territorial limits, nor subject to any civil government, but free in the exercise of her power and rights all over the world." Pius IX., Allocut. Dec. 17, 1860. The Church "is distinguished, and differs, from civil society; and what is of highest moment, it is a society chartered as of right Divine, perfect in its nature and in its title, to possess in itself and by itself, through the will and loving kindness of its Founder, all needful provision for its maintenance and action." Leo XIII., Encycl. on Christian Const. of States. 7. "The Catholic Church has its charter directly from God, it came immediately out of the hands of God, not through princes nor through people. It was first established when all princes and, we may say, all nations were against it. This circumstance was providential, not only inasmuch as it served to show the power of God, . . . but also because the Church in its origin neither required, nor received, nor waited for any consent from existing political states." O'Reilly. S.J., p. 24. See also his excellent remarks p. 154 ff.